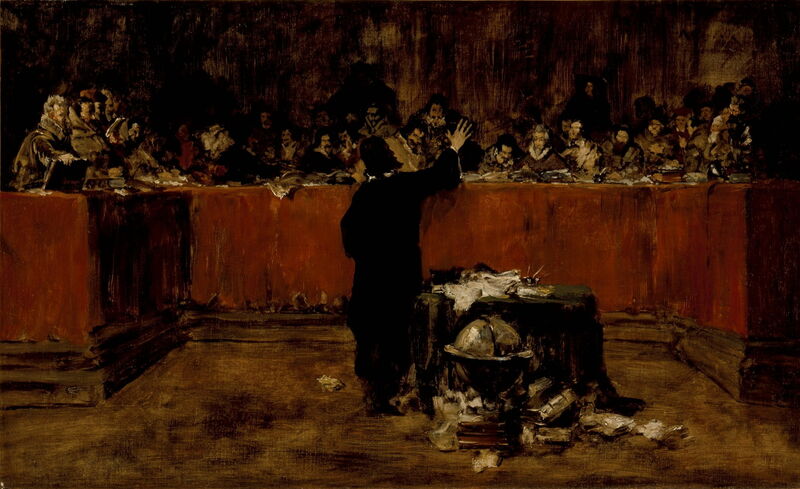 William Merritt Chase (1849-1916), Christopher Columbus before the Council of Salamanca, version A (sketch) (1876), oil on canvas, 58.4 x 94.6 cm, Los Angeles County Museum of Art (Gift of Pamela Edwards McClafferty and Larry A. Thompson), Los Angeles, CA. Courtesy of Los Angeles County Museum of Art. You may know William Merritt Chase (1849-1916) as one of the American Impressionists, and as one of the most influential teachers of his time, but did you know that he made two history paintings? After his initial training in Indianapolis and New York, Chase decided that he needed to go to Europe to complete his training. He decided against the many distractions of Paris, opting instead for the Royal Academy of Fine Arts in Munich, where he knew that he would work harder and get greater benefit. His teachers there were Karl von Piloty (1826-1886), an eminent history painter and head of the Academy, and Alexander von Wagner (1838-1919), a former pupil of Piloty and the Professor of History Painting until 1910. Chase studied and painted at the academy from 1874 to 1878, in his final years there being commissioned by von Piloty to paint portraits of his family, and being offered a teaching position there, which he declined in order to return to New York. In spite of his sustained efforts to avoid history painting, in 1876 he ran out of excuses, and had to do so. The best of Chase’s surviving paintings from his days in Munich are in two series: one centred around Renaissance court figures, often with a pink cockatoo, the other a series of wonderfully painterly portraits of young working boys. “Keying Up” – The Court Jester (1875) won Chase a prize at the 1876 Philadelphia Centennial, and The Turkish Page (Unexpected Intrusion) (1876) caused a sensation when it was shown in New York in 1877. 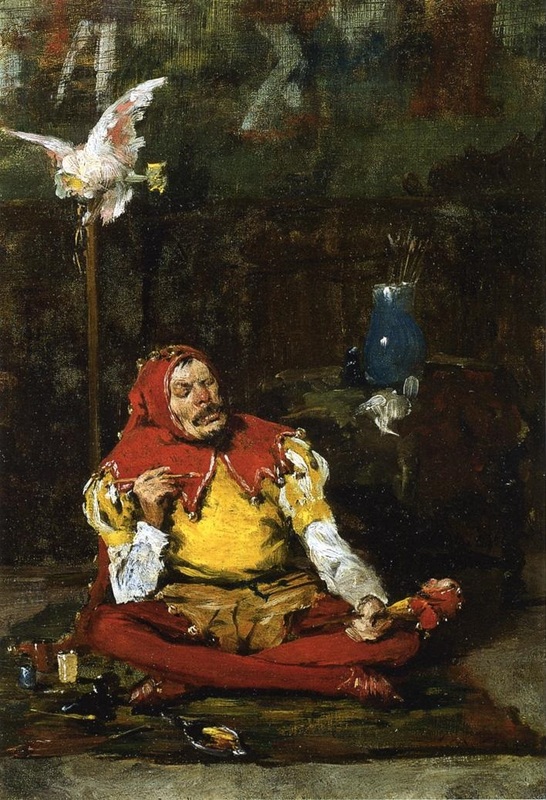 William Merritt Chase (1849–1916), The King’s Jester (1875), oil on canvas, 47 × 33 cm, Private collection. Wikimedia Commons. 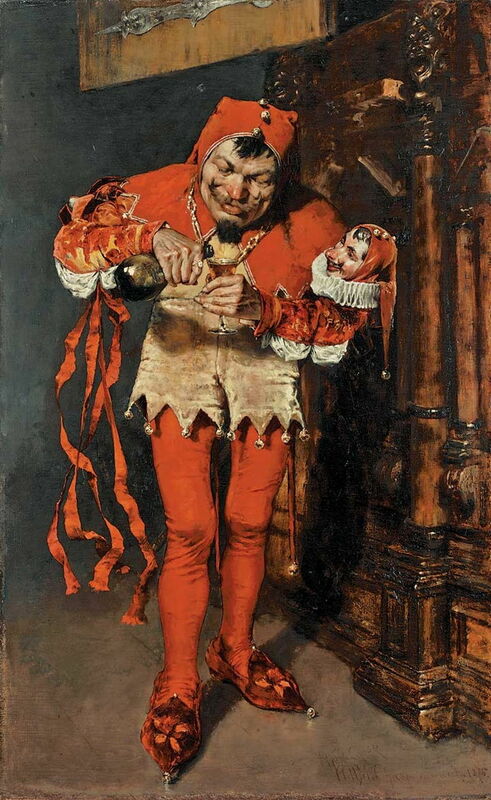 The King’s Jester (1875) seems not to have enjoyed quite the same success, but is an exceptional work for a student, even one of Chase’s experience. 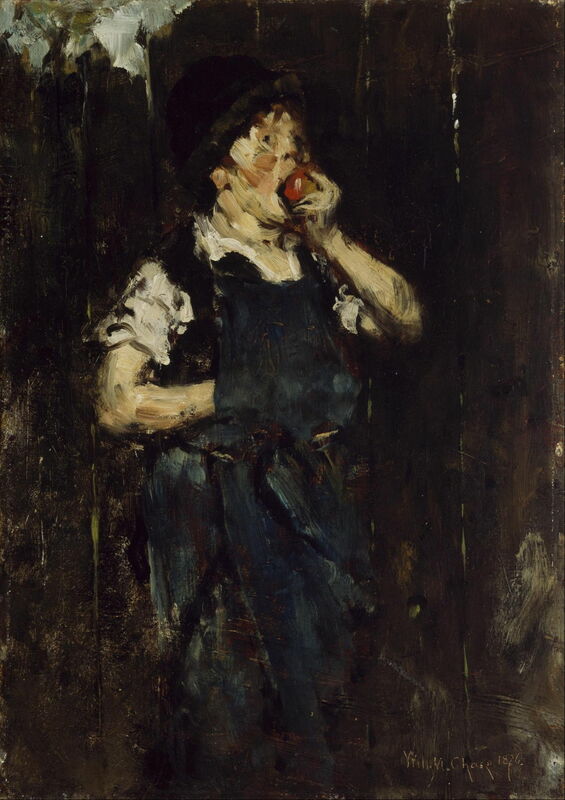 William Merritt Chase (1849–1916), The Apprentice (Boy with Apple) (1876), oil on canvas, 33 x 46.4 cm, Museum of Fine Arts, Houston, TX. Wikimedia Commons. The Apprentice (Boy with Apple) (1876) is an example of his insights into the roguish young men of the time. William Merritt Chase (1849–1916), View near Polling (1876), oil on canvas, 92.1 × 121.9 cm, Crystal Bridges Museum of American Art, Bentonville, AR. Wikimedia Commons. 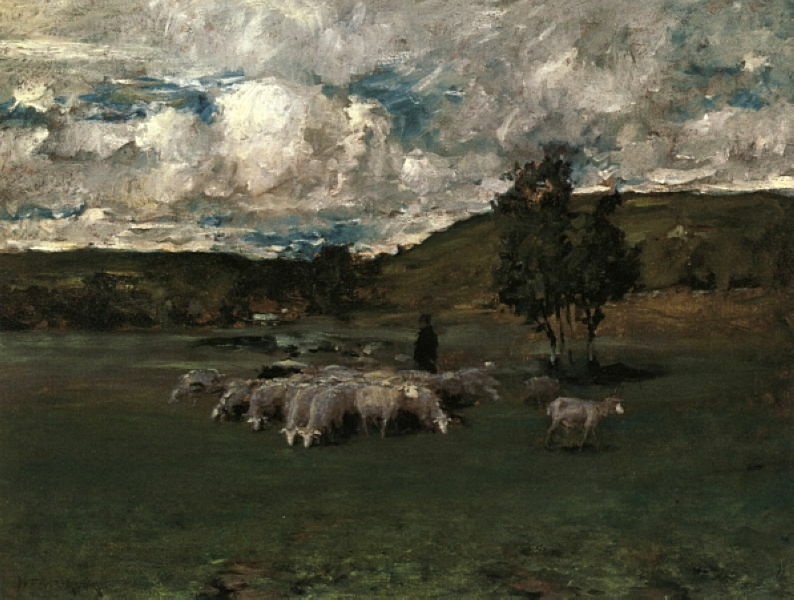 He also painted some landscapes, including View near Polling (1876) with its powerful clouds. 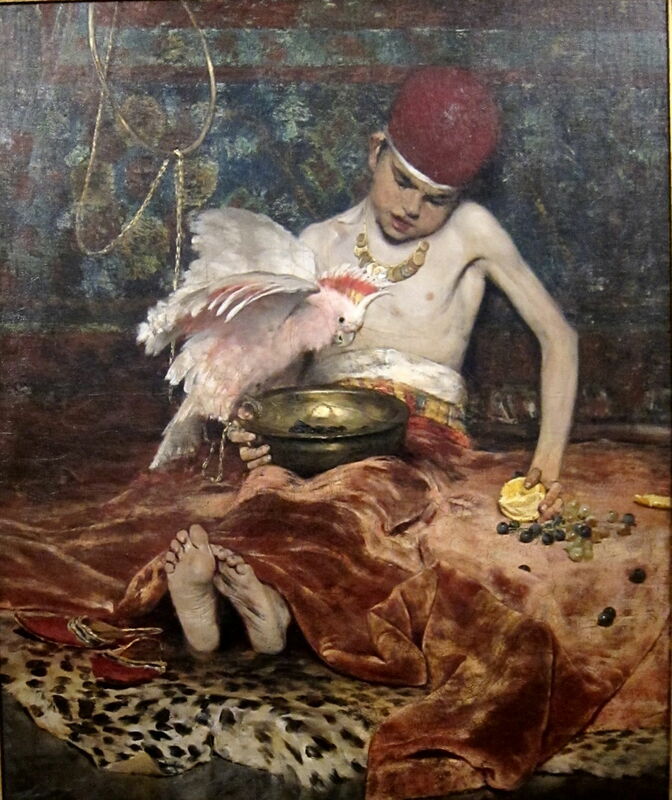 This was painted close to the village in which his companion Frank Duveneck was to open a painting school in 1878. But despite these best efforts, in 1876 he finally succumbed to the need to paint history. We do not know whether the theme was his choice – I suspect that it was set for him by the academy jury who were to assess it – but it turned out to be one appropriate for an American: Christopher Columbus before the Council of Salamanca. The Genoese explorer Christopher Columbus (1450/1-1506) is generally accepted as the first non-Viking European to reach the ‘New World’ of the Americas, when he set foot in the Bahamas in October 1492. His voyage from the Castilian Canary Islands had taken just over two months, but it had taken him seven years to be able to set sail. Columbus sought sponsorship from the monarchs of Portugal, England, and Spain, but it wasn’t until April 1492 that King Ferdinand and Queen Isabella of Spain finally gave him the support that he needed. Emanuel Leutze (1816–1868), Columbus Before the Queen (1843), oil on canvas, 96.5 × 127 cm, Brooklyn Museum, New York, NY. Wikimedia Commons. Paintings showing Columbus undergoing this protracted ordeal usually focus on his various audiences with the monarchs, here Leutze’s Columbus Before the Queen (1843), which Chase may have seen. Amazingly, Leutze painted at least six different treatments of this motif. 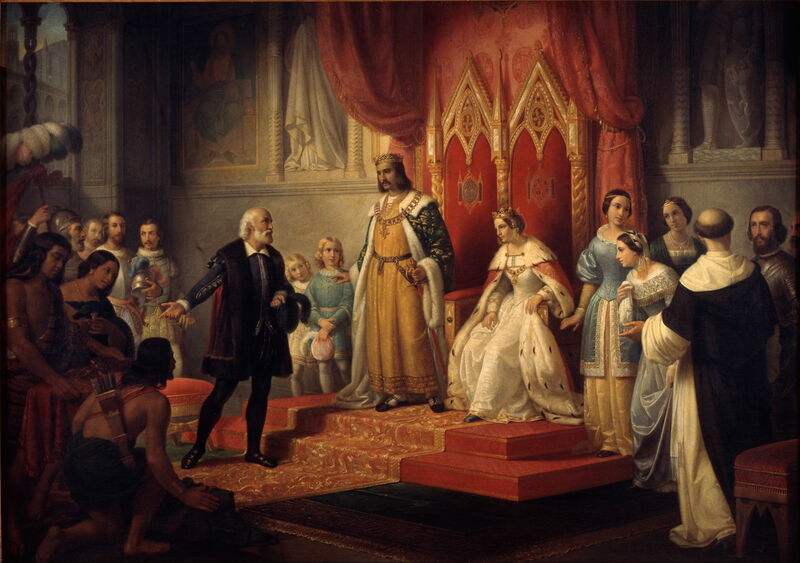 Juan Cordero (1822-1884), Christopher Columbus at the Court of the Catholic Monarchs (1850), oil on canvas, 180.5 x 251 cm, Museo Nacional de Arte, Mexico City. Wikimedia Commons. The Mexican painter Juan Cordero had also painted his Christopher Columbus at the Court of the Catholic Monarchs (1850). 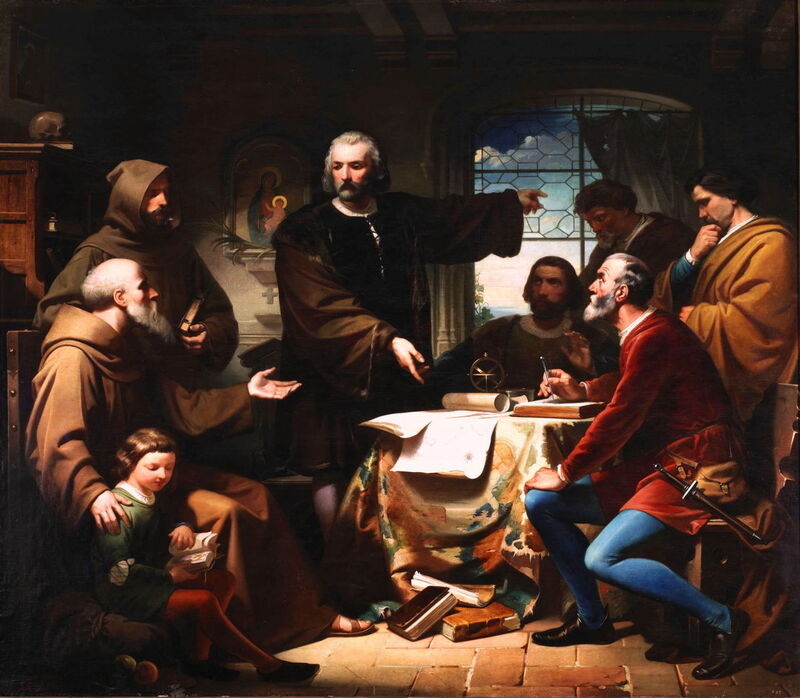 Eduardo Cano de la Peña (1823–1897), Christopher Columbus in the Monastery of La Rabida (1856), oil on canvas, 230 x 260 cm, Palacio del Senado de España for Museo Nacional del Prado, Madrid. Wikimedia Commons. There were two other key events in Columbus’ campaign: his presentation before the Council of Salamanca in the winter of 1486/7, and that to the monks of the Friary of La Rábida in the winter of 1491/2, shown in Eduardo Cano de la Peña’s Christopher Columbus in the Monastery of La Rábida (1856). The University of Salamanca is one of the oldest in the world, having been granted a royal charter in 1218, just nine years after the foundation of the University of Cambridge in England. Columbus faced his toughest audience when he was called to present his proposals to the academics of the Council of Salamanca, at the Dominican Monastery of Saint Stephen. 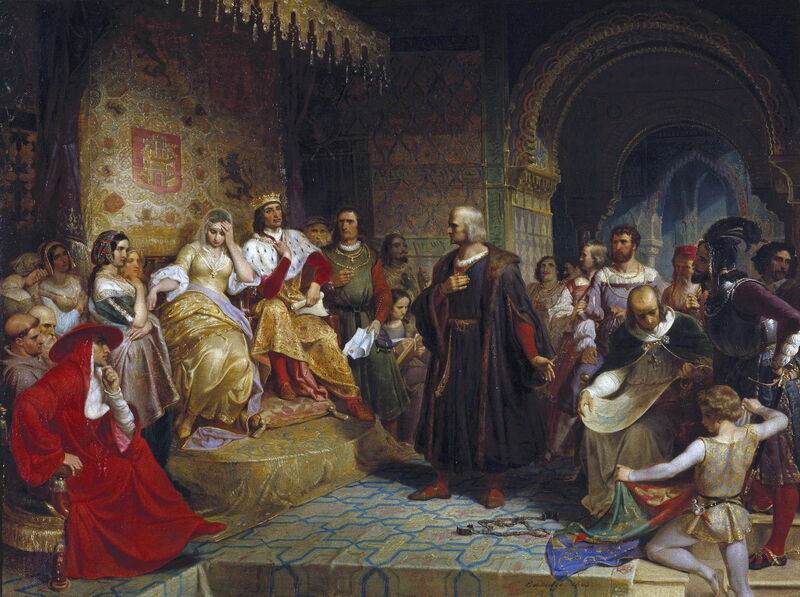 Chase’s first oil sketch, version A of Christopher Columbus before the Council of Salamanca (1876), was awarded first place by the jury. But Professor von Piloty was not so easily pleased: Chase had not followed convention and put Columbus in the centre, so he was told to paint version B (below). 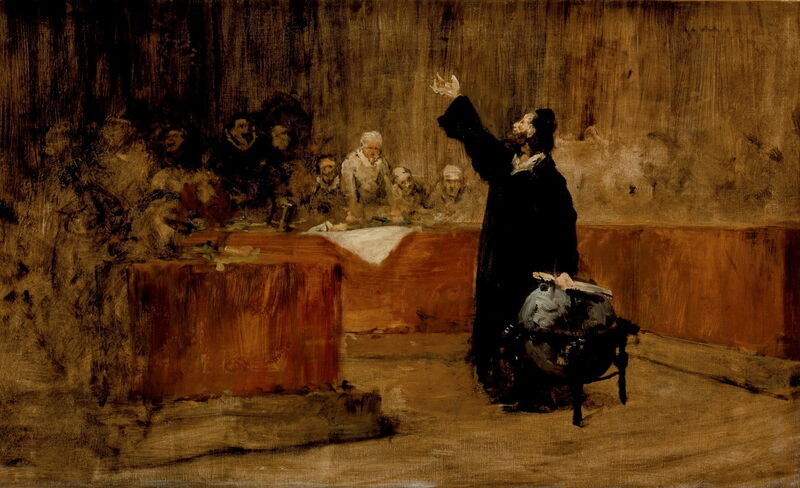 William Merritt Chase (1849-1916), Christopher Columbus before the Council of Salamanca, version B (sketch) (1876), oil on canvas, 57.2 x 92.1 cm, Los Angeles County Museum of Art (Gift of Pamela Edwards McClafferty and Larry A. Thompson), Los Angeles, CA. Courtesy of Los Angeles County Museum of Art. It is worth noting that Cano de la Peña had placed Columbus centrally, as had Leutze. Cordero, in deference to the monarch, had placed the King in the centre, with Columbus and the Queen on either side. Chase had tackled a similar problem to that posed by the Judgement of Solomon, and had devised a composition which put Columbus in profile, rather than facing away from the viewer. We should be grateful that Chase understandably abandoned history painting and returned to the US, to paint landscapes and portraits. Posted in General, Painting and tagged Cano, Chase, Columbus, Cordero, history, Leutze, narrative, painting. Bookmark the permalink.